Skutt's KM Series kilns offer electronically controlled, digital firing with traditional Skutt features and quality. Skutt's automatic kilns integrate the finest in quality features with the new KilnMaster electronic controllers. Automatic kilns provide firing accuracy, convenience, and repeatable results. 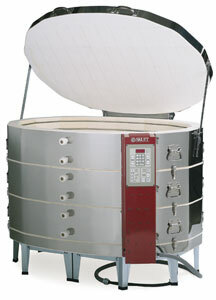 Skutt's Model KM 1627 is a completely new design for a Skutt Kilnmaster kiln. It offers a huge oval firing chamber that measures 46" on the long axis, 30¾" on the short. This gives it an unparalleled 18.5 cubic feet of capacity, unprecendented for kilns in this class and price range. Model 1627 is a true workhorse among production kilns, offering a huge volume of firing space for a given capital or energy budget. Fire pieces at temperatures up to Cone 10 or 2350°F (1288°C). Skutt KM Series kilns are the very best when teamed with the Skutt EnviroVent Kiln Ventilation System. Program the kiln and proper ventilation is assured. Model KM 1627 has all the standard features of the Kilnmaster series, including a smooth touch pad, a digital readout showing prompts, messages, and temperature,an alarm setting, delay firing option, and more. KM Series Kilns offer slow, medium, or fast firing speeds. Use cone fire mode to let you enter desired cone number. Limited 2-year warranty, UL and CSA listed. Kiln Return Policy— Kilns are custom-built to order and are shipped directly by the manufacturer; therefore, Blick is unable to accept returns. Please review all information and contact our customer service department to address any questions prior to ordering.